Restorative dentistry is the branch of our profession that helps people who want to improve the look of their teeth or those who need reconstructive surgery after an accident. There are many procedures we can use to help you reach your goals depending on your specific situation. Our goal is not only to make your smile look beautiful to others, but to restore the functionality of all your teeth, so you can improve your quality of life and feel confident when doing everyday tasks. * Fillings. These are routine dental techniques that take care of things such as cavities. * Crowns. A crown is a porcelain cap that goes over a tooth with a defect to protect it from further deterioration. * Dental Bonding. Bonding can repair simple cracks or chips as well as teeth that are uneven or discolored, by scraping the enamel and bonding a thin layer of porcelain over it. This is ideal for young patients. * Dentures. Dentures are used for patients who have one, several, or all of their teeth missing. A partial is anchored by existing natural teeth, while a full denture is placed over the gums and functions as your teeth do. * Dental Implants. Implants are one of the best options for patients with some or all missing teeth. Even if you have lost only one tooth, a dental implant is a great choice because it encourages bone growth. Implants are made from titanium which bonds with natural bone. In general, we can use one or more restorative dentistry procedures to help patients who want to improve their smiles for cosmetic reasons or those who need to have these procedures for health reasons. 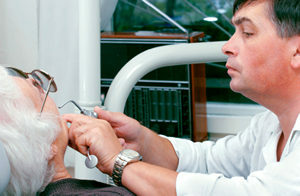 We offer a free consultation to discuss your dental issues and what methods we can use to help you.